Dr Aparna Raniga is a Sydney based Ophthalmologist and a Fellow of the Royal Australian and New Zealand College of Ophthalmologists. She is a comprehensive Ophthalmologist with subspecialist training in glaucoma, cataract and uveitis. Dr Raniga offers laser treatment for glaucoma and specializes in advanced glaucoma surgery, specifically trabeculectomy, deep sclerectomy and tube shunt surgery. She is also extensively trained in cataract surgery in glaucoma patients. Dr Raniga consults at Nexus Eyecare Norwest and South Western Eye Care Bankstown. She undertakes surgery at the Hospital for Specialist Surgery in Bella Vista. Dr Raniga takes pride in keeping up-to-date, bringing the latest evidence and advances in ophthalmology to her patients by attending local and international meetings. Dr Raniga is committed to ongoing education and has commenced a Masters in Public Health with the University of Sydney in 2018. 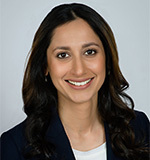 Dr Raniga understands the importance of listening to her patients, discussing treatment options in detail and tailoring the best evidence based care to individual patients needs. Besides English, Dr Raniga is fluent in French and Hindi, Telugu, Marathi and Gujarati.